Steve Wing is a visual artist and writer whose work reflects his appreciation for the extraordinary in ordinary days and places. He lives in Florida, where he takes dawn photos on his way to work in an academic institution. A regular contributor to the BluePrintReview, his images also have appared in other e-zines including Eclectica, Perigee, qarrtsiluni and Pequin. "Light, light is what I see and photograph, really. It doesn't have to be direct or bright, but it is light that I am stalking with my camera. And its varying moods reveal different aspects of the ordinary world. Like this photo above, of a banana tree in the back yard. 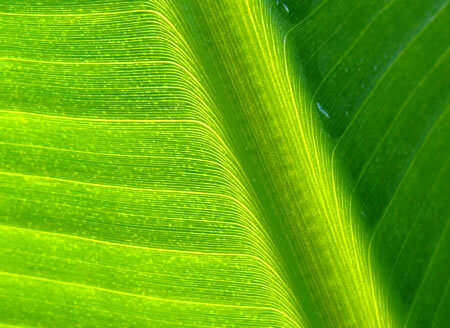 The leaf's extraordinary organization and structure are exposed by the light of that particular moment. Our world offers us such glimpses every day." Some current contributions to blog carnivals can be found in fireflydomain's posterous blog. Several of his posts and images are up in the blueprint blog 'just a moment', including travel notes from Lisbon, stormchased beach entries, and solstice / wave images: just1m/Steve_Wing. Currently, he is involved in an international group writing project: 2028 - a world novel. "The process is boringly familiar: point camera, press button. Repeat. That is what an observer would see..."
Read more, here: Notes on the Process.